The GIC model has evolved significantly over the last decade, and is gearing up for the third wave of evolution – GIC 3.0, as some are calling it – driven by GICs’ strong desire to move away from the “arbitrage-first” delivery model towards a “digital-first” model. Everest Group describes the journey to mature GICs as progressing through four different stages. Our research shows that best-in-class – or Stage 4 – GICs deliver up to six to eight times incremental value beyond arbitrage. Yet, while many of our engagements over the last few years have made it clear that most Global 1,000 GICs deliver value beyond arbitrage, very few track and measure their impact. When they do, it’s typically in a piecemeal, selective manner. Thus, their parent perceives that they are delivering limited business value, beyond arbitrage, to the enterprise. By educating their parent on their impact, GICs can improve their credibility, and build a case to secure support for expanding their role. So how can GICs measure and articulate the value they deliver? We believe that putting a dollar number to the business impact is the most objective and effective way for GICs to showcase their true worth. The framework we use maps value drivers linked to savings, risk, and revenue, quantifying all forms of impact created by the GIC. Here’s an example: a U.S. company’s GIC was able to prove to its parent that it delivered US$20 to 22 million in overall business impact, compared to incremental cost arbitrage of US$4 to 6 million, through increased effectiveness, greater efficiency, and revenue growth. This helped the GIC secure the parent’s buy-in on increasing the scope of functions currently delivered out of their GIC. Contact us about Everest Group’s business impact quantification framework, and learn more about our research on in-house delivery models. Earlier this year, Everest Group and The Rockefeller Foundation partnered on research in support of the Foundation’s Digital Jobs in Africa (DJA) initiative, the goal for which is to demonstrate the value of impact sourcing and promote its adoption in South Africa and beyond. Impact sourcing is a business process service delivery model that provides employment opportunities to previously unemployed individuals who have not been meaningfully engaged in the formal economy. Generally, the individuals who are employed via impact sourcing belong to economically and/or socially disadvantaged backgrounds, or are differently-abled. 50 to 55 percent of the ~ 235,000 FTEs in the South Africa BPO market qualify as impact workers. This high share is because there is no, or limited, difference in the profile of impact and traditional workers hired in normal course of operations, meaning that although companies hire impact workers, they do not claim it to be impact sourcing. During our research, companies indicated that impact workers, especially those who have gone through training programs, exhibit better behavioral characteristics. These include higher adherence to timetable, lower absenteeism, higher motivation level, and lower attrition. In fact, as it relates to workforce stability, which is a critical component of the value proposition, the companies indicated almost 50 percent lower attrition among impact workers as compared to traditional workers. 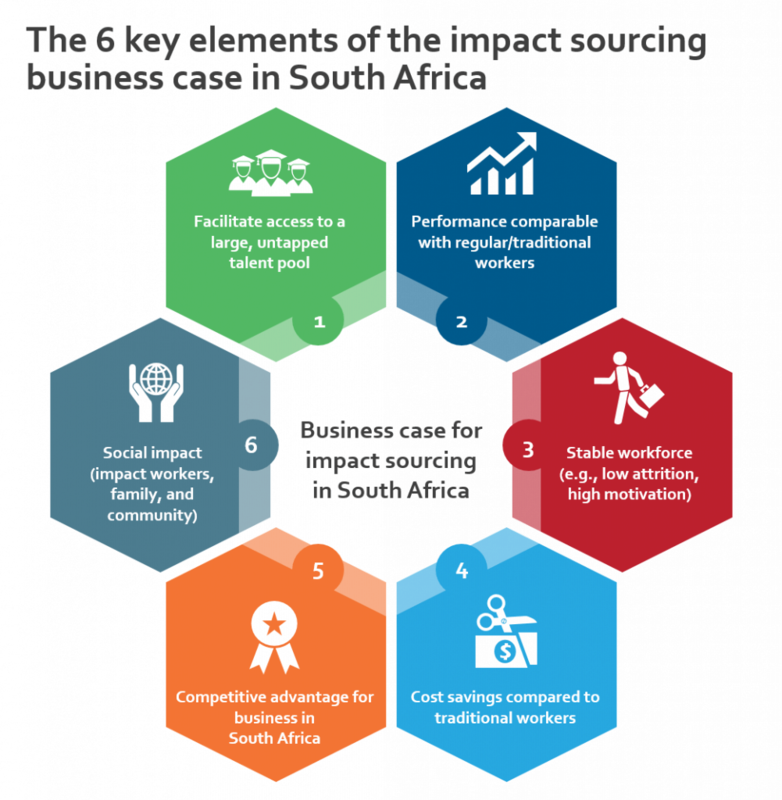 A unique feature about impact sourcing in South Africa is the presence of a robust ecosystem comprised of BPO service providers, buyers, training academies, and government/industry associations. The presence of impact sourcing-focused training academies is a key element of this ecosystem. These academies, such as Careerbox, Harambee, and Maharishi Institute, help buyers and service providers identify, screen, and train entry-level candidates through job readiness training or learnership programs. The thrust of these programs is on intentional talent development to ensure impact workers are employment ready. These programs include training on technical skills (e.g., computer literacy and language) and soft skills (e.g., adapting to a corporate environment, dealing with stress, and the benefits of stable employment). In fact, providers including Aegis, CCI, and WNS have established their own in-house learnership programs as part of their intentional focus on impact sourcing. Since our last study in 2014, there have been some significant positive developments in the impact sourcing market landscape in South Africa. Perhaps the most important is the higher level of maturity exhibited by companies in understanding the benefits and challenges associated with impact sourcing, thereby, enhancing intentional adoption. Moreover, there has been a shift in the value proposition toward “accessing relevant talent” rather than just “cost savings.” In the past, companies had expressed concerns related to higher upfront training and the administration cost of impact sourcing programs. But our research established that the total cost of ownership (TCO) for impact sourcing is 3-10 percent lower than that of traditional sourcing. Finally, companies are increasingly adopting impact sourcing for the many different types of value it provides. For example, significantly lower attrition among impact workers not only contributes to improvement of the work culture of the organization, but also translates into better service delivery. As there is an intrinsic link between adoption of impact sourcing in South Africa and the expansion of the BPO market in the country, there are understandably concerns around security risks, the impact of automation technologies, etc. Nevertheless, our study shows that the desire to intentionally adopt impact sourcing in the country has increased, and that the model is expected to grow, albeit gradually. For more details on impact sourcing see our additional insight infographic. With increasing pressure on Global In-house Centers (GICs) for additional value creation, and exhaustion of traditional means, Robotics Process Automation (RPA) – an automation technology that can handle rules-based and repetitive tasks without human intervention – is fast emerging as the key lever to drive productivity. RPA has the potential to reduce GIC headcount by 25-45 percent, depending upon the process type and extent of deployment. This results in significant cost savings for the GIC, including salaries and benefits for delivery team members replaced by the software bots, and non-people costs such as facilities, technology, and other operating expenses. Typical offshore GICs supporting horizontal functions such as F&A from Tier-1 Indian locations are likely to witness cost savings of 20-25 percent through RPA. Beyond cost savings, RPA provides improved service delivery in the form of process quality, speed, and scalability, and better ability to manage through improved governance, security, and business continuity. Development of an RPA solution requires substantially less time than comparable technologies such as Enterprise Application Integration (EAI) and BPM workflow solutions. This, in turn, reduces the time for RPA implementation and value realization, and offers quick return on investment, typically only six to nine months to recover the initial investments. Further, RPA is typically deployed in a phased manner. 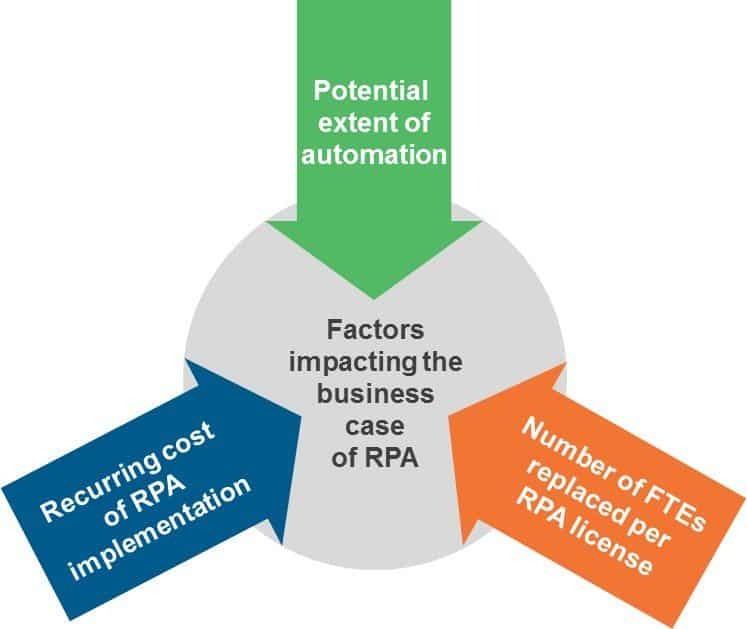 The relatively short payback period for initial investment in RPA mean subsequent phases can become self-funded from the savings realized from the earlier implementation. GICs typically consider a minimum of 15 percent cost savings when developing an RPA business case. The savings are dependent on a number of factors, which can be adjusted suitably to build a favorable business case. Highlighted below are the key factors impacting the business case. Headcount reduction due to RPA varies with the potential extent of automation that can be achieved, which in turn impacts the cost savings. As RPA’s sweet spot is transactional/rules-based processes, there is considerable potential for headcount reduction and cost savings when it is deployed to handle these processes. The number of FTEs that can be replaced per robot varies by the process and type of RPA solution. The higher the number of FTEs replaced, the greater the cost savings. Both, the number of FTEs replaced per robot and the cost savings, can be increased by targeting standard transactional processes with significant volume. Recurring costs for RPA – such as licensing, hosting, and monitoring – vary significantly by vendor and type of solution, in turn impacting the cost savings. The lower the recurring costs, the higher the cost savings. For more drill-down details, please refer to Everest Group’s report, Business Case for Robotic Process Automation (RPA) in Global In-house Centers (GICs). This report assesses the business case for adoption of RPA in offshore GICs, with information on cost savings across individual components and the associated payback period. It also analyzes the impact of change in the above factors on the business case, and the threshold limits for each in order to have a justifiable business case. Further, it includes case studies on GICs that have adopted RPA, along with key learnings and implications. The Global in-house Center (GIC) model continues to grow across industries, functions, and emerging markets ‒ from the financial services and technology industries to most verticals, from call center and R&D to a diverse set of functions, and from India to most emerging markets. As the model continues to grow, with GICs evolving from low-cost service delivery centers to strategic entities driving value beyond cost savings, they face strategic and operational challenges: demand fluctuation management, talent management, driving further optimization through adoption of industry best practices, and knowledge management, to name just a few. In this hybrid sourcing model, the GICs use service providers and/or manage their delivery on behalf of the parent organization. This also includes situations in which the GIC is driving or supporting sourcing initiatives (e.g., service provider selection or contracting) on behalf of the parent organization. Everest Group, in collaboration with the Shared Services and Outsourcing Network (SSON) and NASSCOM, recently conducted a survey on hybrid sourcing adoption trends in offshore GICs. Eighty percent of the respondent GICs have adopted hybrid sourcing, leveraging service providers predominantly to manage volume fluctuations, lower costs, and access best practices. As the graphic below shows, most (80%) responded that hybrid sourcing is meeting or exceeding their expectations. Our research shows that service delivery improvements and governance enhancements are the top priorities for the GICs. Therefore, it is not surprising that GICs collaborate with service providers across three key associated areas – supporting service provider delivery, supporting/implementing the parents’ service provider sourcing program, and identifying global sourcing opportunities and designing the sourcing model strategy. As GICs evolve in their operating models, they are likely to look for more opportunities to work with service providers in these priority areas to enhance the overall impact. Going forward, it is safe to assume that there are multiple opportunities for service providers to work with the GICs. However, further adoption of hybrid sourcing in GICs will be driven by their ability to influence the mandate from the parent organization, and service providers’ ability to assess the opportunities. Understanding GIC maturity will also be a critical factor driving these collaboration opportunities. This is the final blog in a series of three on the topic of impact sourcing. In the first one, I covered the fundamentals of the model and in the second, the value proposition and business case. Now, I’ll share insights on the nature of work it is best suited for and the activities the model can potentially deliver. Given that the targeted talent for impact sourcing are individuals with disadvantaged backgrounds, their skills levels are typically suited for specific types of BPO activities as given below. Having said the above, impact sourcing employees have demonstrated a wide-range of aptitude from basic data entry to complex data processing. For example, Pangea3 used impact sourcing to deliver complex contract abstraction services; Deloitte in South Africa is using impact sourcing to deliver accounting services and is considering hiring impact workers in its other offices across Africa. So, what does this mean for companies considering impact sourcing for BPO work? Are there tangible examples of work where companies use impact sourcing in a meaningful manner? The answer is an unequivocal yes! To illustrate impact sourcing in action, consider the example of a typical optical character recognition (OCR) image validation process given in the box below. The blue text represents activities that fit with impact sourcing and may be completed by impact workers. There are many more such processes where impact sourcing can be an attractive fit for delivery of BPO services. Some of these are given in the table below. The notable point is that there are companies already using impact sourcing to deliver many of the services mentioned above. For example, RuralShores is delivering invoice processing, mortgage document digitization, customer care, logistics management services using impact sourcing. Accenture uses impact sourcing to deliver not only basic F&A processes but also more complex HR, PO, F&A functions. These are also echoed in the examples from Aegis, Infosys, and Quatrro. We also saw earlier how Deloitte and Pangea3 are using impact sourcing for complex work. These examples substantiate that impact sourcing is actionable and a viable alternative to traditional BPO. In conclusion, in this series of three blogs, I discussed how impact sourcing is an established phenomenon that offers access to previously untapped talent pool, lower attrition and the ability to achieve corporate social responsibility and diversity objectives as compared to traditional BPO. There are many large, global companies that have acknowledged the benefits of impact sourcing and have adopted it in their business process service delivery. It is a win-win business service delivery model with optimized enhancements and creates tangible positive impact on people that extends to communities as well. Be sure to join our webinar, The Business Case for Impact Sourcing on today at 9 a.m. CT / 10 a.m. ET / 3 p.m. BST / 7:30 p.m. IST. Register now.